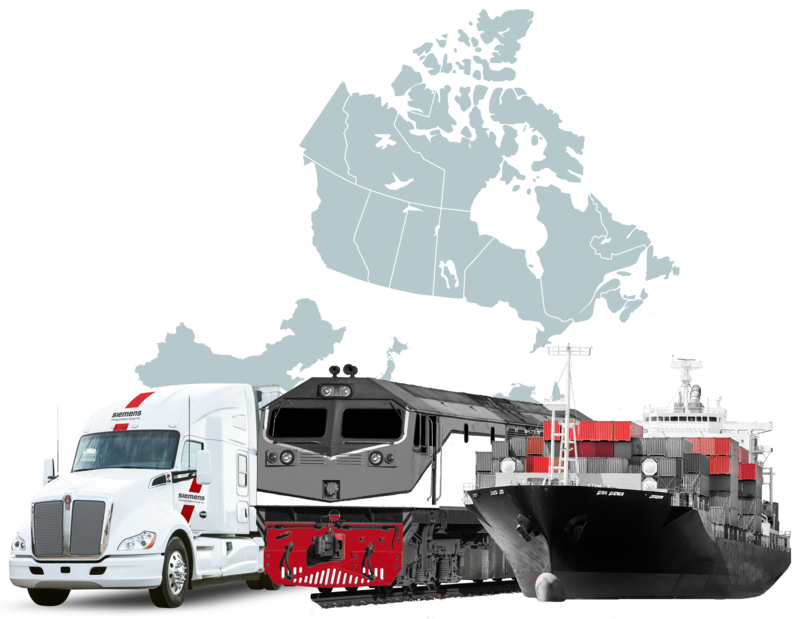 The Siemens Transportation Group Inc. spans across North America. As an international, family-owned operations, it encompasses specialized transportation companies for a total supply chain solution. We work 24 hours a day, seven days a week, all year long to deliver on time. Every time. 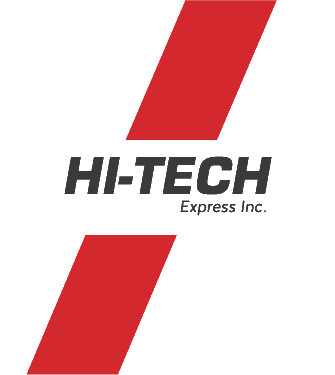 We stand by our reputation of consistent and efficient service, with dedicated switches and regular schedules that our clients from across North America have come to rely on. Less Than Truckload shipping can still be a burden without the right partners to shoulder the load. 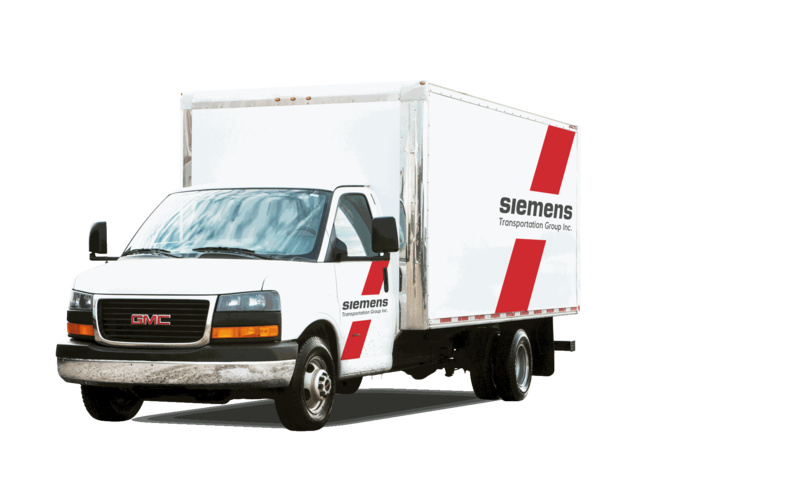 Siemens takes care of every detail of the transportation of single skid and multi-skid shipments so our customers can rest easy. Our mission is to reduce costs while improving service. This means custom business solutions and consolidation/deconsolidation programs that utilize our TL, LTL, and Express divisions. 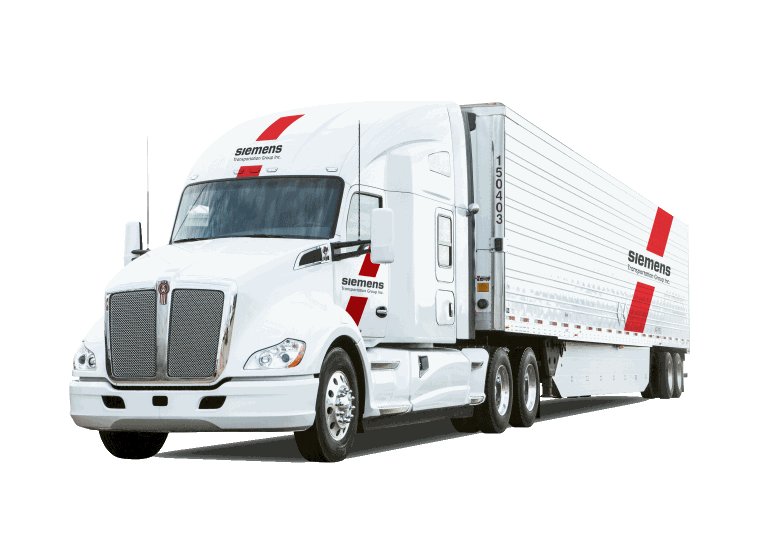 Between our large fleet of equipment that includes reefers, heaters, dry vans, body jobs and rail cans and extensive services like power tailgate, heat and dangerous goods we have what it takes for almost any job. Our commited customer service team is ready and more than willing to assist you. We are proud to be a “Carrier of Choice,” an award that carries extra weight because it comes from our loyal customers. It’s this strong customer base that’s allowed the Company to expand. We operate in eight major centres across Canada and are linked to more than 10 000 locations from coast to coast. Forget impersonal call centres, we have local customer staff that know and understand your business. Bar code technology, online tracking and personalized care come together for time sensitive delivery of envelopes, parcels, small skids and more. It takes highly trained operators and specialized equipment to transport over-dimensional loads and significant pay loads, and we’ve got both. 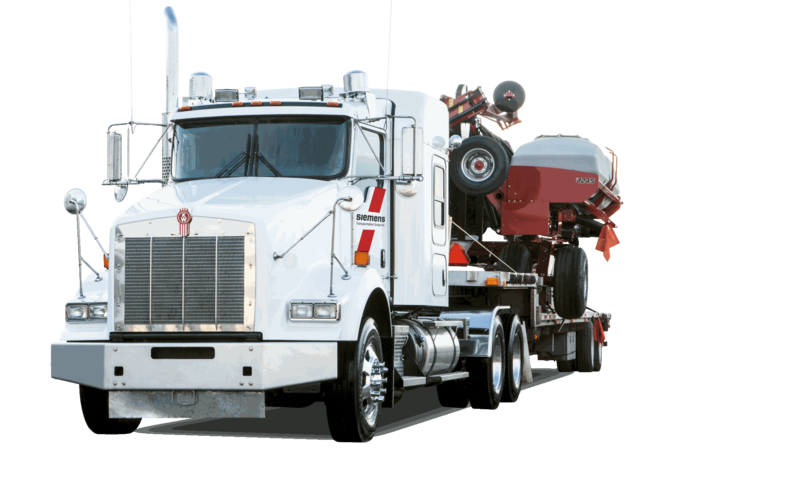 We offer a diverse fleet of equipment to suit the needs of all industries; construction, mining, forestry, and agriculture, along with drivers who care to ensure that your cargo arrives on-time without hassle. When it comes to flat deck, no matter the complexity look to the Siemens team for your solution. When awkward loads turn to “nearly impossible” loads, we’ve got you covered. From 5 axle to 13 axle configurations we’ve got what it takes to move your product – whether it be transformers, steam generation units, wind towers or a variety of other loads. A team of transportation experts are in place and ready to assist you in all aspects of planning and executing your move – including project management, route surveys, pilot cars, the necessary permits and liaison with the appropriate government/utility departments. Those significant payloads that exceed normal weight and measurement regulations are handled with the utmost care and expertise to ensure that you have peace of mind throughout the entire process as we deliver the impossible. 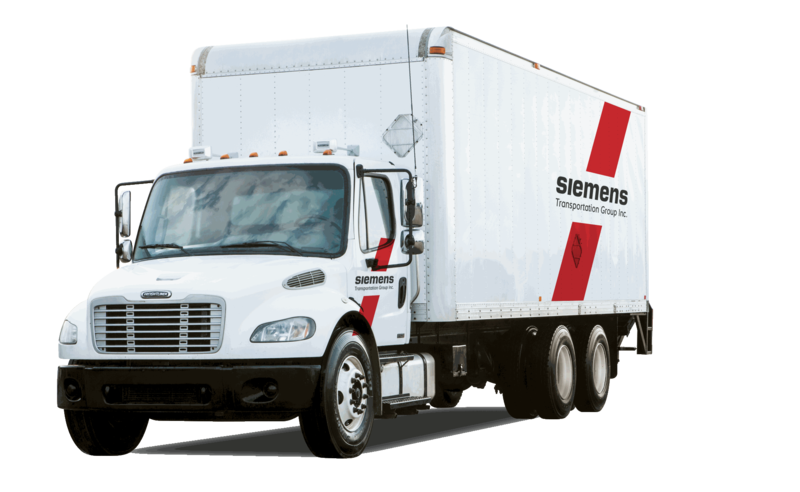 As a full-service, third-party logistics provider, Siemens is a company customers rely on. We recognize that transportation is more then just picking up freight at point A and delivering to point B. Supply chain solutions have taken precedent for manufacturers and distributors as they look for a balance between cost and profitability. We leverage the Group of Companies , thereby improving and supporting capacity for our customers, and extending the Company’S North American coverage. This allows us to offer a fair and competitive price to our customers. Our multimodal approach includes transportation management service for any transportation needs. At STG, Transportation Management Software helps drive and align process improvement and efficiencies for our customers. Tied to our WMS ( Warehouse Management Software) our customers requiring warehousing and distribution have complete connectivity and data integrity to manage costs and improve profitability. Our warehousing network encompasses Calgary, Edmonton, Regina, Saskatoon, Toronto, Vancouver & Winnipeg. STG Fleet Services is a full maintenance fleet service provider supporting the 9 different transportation companies and their 2,000 vehicle assets which operate throughout North America. Over 100 skilled and licensed technicians operate out of 5 strategically located maintenance facilities. Assurances are made when it comes to availability, reliability and utilization by using the latest technology to diagnose and maintain the wide ranging fleet. 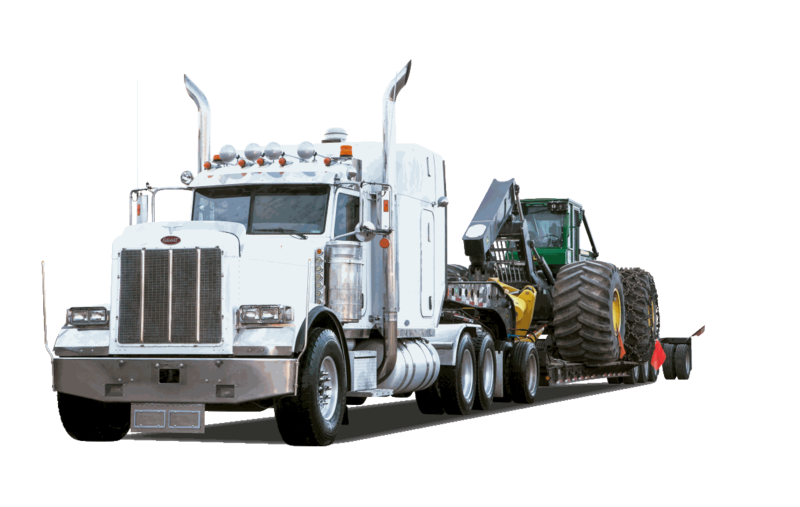 We provide a 24/7/365 Emergency Road Side Service Call Center which handles all mechanical issues and directs the repair to one of our many facilities or to pre-approved extended maintenance providers which ensures minimal downtime or interruption to the customers shipment. The STG Fleet Maintenance team is committed to keep the rolling stock active and executing on our promise to deliver on time, every time.